The merchant freighter S.S. Wanderer lurched violently to the side as another blast tore across her flimsy hull that had never been designed for combat or really much of anything else. "Report!" Captain John Graves called out above the sound of the hull framework grinding away at itself as the tired old ship performed manoeuvres that would have been ill advised when she was a current model. Her main bridge complex stuck out from a saucer section and housed a low-powered defector array that was more than adequate for her top speed of warp-6. Her speed, such as it was, was provided by a pair of nacelles that had been salvaged from a racing yacht that the owner had clumsily piloted into the side of the freighter some time in her distant past. The mismatched parts had driven her value down to a point where the asking price could be met by her current crew, on a strictly observed policy of no refunds. "I just can’t get a lock on the damn thing…" Commander Winston Morrow cried out above the wailing warning klaxons as a jet of smoke blasted from his console. "Maybe the attacking ship is cloaked or something?" "It can’t be firing if it’s cloaked." Captain Graves replied haughtily, turning his attention to the bank of controls behind him as shattered power conduits released flashing arcs of electrical energy skipping across the bulkhead. "She isn’t going to take much more of this." "She’s a light freighter, not a battleship." Winston nodded as his control panel winked out and fluttered reluctantly back to life before him. "I don’t think I can take much more of this." "Captain!" A voice called out over the internal comm channel. "Report!" Captain Graves shouted as he dropped heavily into the command seat at the centre of the small bridge and pressed down on the small panel to his left. "This is Haldo Compz in engineering." The voice continued in a grating and irritatingly calm monotone. "She can’t take much more of this." "Shields are almost gone!" Commander Morrow screamed as an emergency light lit up on his console warning that he may very well soon be dead. "Tell the crew to abandon ship…" The Captain said in an angry tone, his mind stubbornly refusing to furnish him with a plan that might otherwise save them all. "They didn’t need much telling." The commander grunted. "They all left when the shooting started, we’re the only ones left on board!" The hull grated with the gut wrenching sound of internal support joists shearing as the ship banked hard to starboard in a futile attempt to evade her pursuers. "That can’t be good!" Commander Morrow cringed, glancing around the roofing joists and imagining them falling on top of him. "Open a channel or something!" Captain Graves said hopelessly. "They wouldn’t talk to us before, they’re certainly not going to now that our communications array is destroyed." The Commander wearily sighed at the continuing barrage of incompetence. "What do you suggest?" The Captain growled. "The same thing I always suggest." Winston spun around to face him. "Not getting into this much trouble in the first place!" "You said this would be fun." John Graves sighed, flopping back helplessly into his command chair. "I say a lot of things." The commander said with a note of infuriation evident from the tone of his voice. "I said that one fifty year old phaser bank would offer adequate defence, I said that Tarquarian Gin would be interesting to try, I said that the Sumarilus we met on Draxil 5 was probably a girl." "You’re right." The Captain said thoughtfully while shifting in his chair as the uncomfortable memories were prompted to scurry through his mind. "I must stop listening to you!" "This is Haldo Compz." The intercom chirped again. "Shields are gone, I have no more power from anywhere, unless you want to set fire to the gin." "We need to abandon ship." Captain Graves said sadly. "My poor ship…"
"We’re not leaving, John!" Commander Morrow told him over the din of the automatic fire-suppression system as white smoke blasted across the rear wall, dousing several small fires. "I admire your spirit!" Graves smiled, leaning forward in his chair. "The escape pods are all gone!" The Commander continued. "There was only four!" "Oh." The Captain said, closing his eyes in exasperation. "We have time to make it to the shuttle bay?" "We fitted the bay out with coolant generators and swapped the shuttles for two industrial crates of Tarquarian Gin…" The Commander shouted. "You said we’d make a killing on the trade circuit with that stuff." "I know…" Captain Graves smiled. "I’d just rather not die sober." "Captain!" Haldo Compz cried out over the internal comm system. "I have a partial sensor echo of another ship approaching us." "Looks like we don’t have time to make it to the shuttle bay!" Commander Morrow groaned as his console fluttered again and somehow flashed back to life. "Hmm?" The Captain uttered, missing his comments while burying his problems in a small flask of strong liquor. "You want some of this?" "Yep!" Morrow agreed enthusiastically, jumping up and grabbing the drink with obvious relish between his trembling hands. "The other ship has powered weapons and I’m detecting targeting scanners…" The comm system reported. "It’s been nice working with you." Captain John Graves said to his old friend with a warm smile. "Yeah." Morrow grudgingly agreed, handing back the flask as the powerful and illegal liquid gouged its way across his senses, easing some of his nervousness as a large portion of his brain cells simply rotted away. "Next time I’ll buy the ship and you can be my commander." "Doesn’t seem like we’re going to have to worry about next time." He shrugged, shooting back a large dose of liquid numbness. "They’re firing." Haldo Compz reported. The two officers grimaced and looked at each other with a sigh of grimly accepting their fate because they had no choice but to do so. The Wanderer shot forward under the inertia of her last blast of Impulse power while the small attacking ship stayed beneath her hull, away from her single phaser bank. A sudden blast of energy surged suddenly into the small ship sending it careening away from the helpless merchant vessel. The phaser bolt was quickly followed up with a repeating blast of energy pulses that tore across the tiny vessel and sent blue arcs of energy jolting around her damaged shields. The small craft suddenly vanished in a flash of blurred motion as it went to warp while still barely able to do so. "What the hell?" Captain Graves began. "Aren’t we meant to be dead?" "We’re still on board the Wanderer." Commander Morrow observed coldly, the nerves creeping up his spine and making him tremble visibly. "This can only be hell." Suddenly the internal comm system spluttered to life with a shrill whistle. "Stand by and prepare to be boarded!" "Who the hell was that?" Captain Graves jumped away from his chair in surprise. "Definitely hell." Morrow raised his eyes to the ceiling and shook his head sorrowfully. "Maybe Compz rigged the internal system to communicate externally?" Graves suggested hopefully. "He’s a clever little alien." "He’s seven foot tall." Morrow sighed. "And he’s a Moronian who would be offended if he heard you call him that and would probably knock you on your arse." Suddenly a whining sound filled the room that dropped suddenly to a low hum while three pillars of light erupted into the narrow bridge that flickered with sparkling blue energy. Three humanoid forms stepped out of the transporter beams with raised phaser pistols. "Federation!" Captain Graves said with hint of suspicion. "Standard grey uniforms!" "Don’t move!" Said the lead man. He was dressed in a grey jump-suit with a yellow top visible between his padded shoulders. A black ceramic chest-plate was worn by all three officers and the pistols they were carrying were not standard-issue. They were black and larger than normal with a more meaningful discharge vent made from glinting, threatening metal. "Are you Starfleet?" Commander Morrow asked, reflexively raising his hands. The three merchant crewmen were beamed directly to a ships brig where they resided behind a very powerful security field. The brig was made of unfinished metal formed into a cube with raised sections along all edges which projected force-fields at each transparent wall, effectively preventing any kind of escape. Captain Graves looked at Commander Morrow who was perched uneasily on the edge of his cot and hanging his head in his hands while muttering about how much he hated virtually every aspect of his life. "What’s the charge?" Graves ventured to one of the two officers on duty in the security station. One turned to face him. The young officer looked him up and down and then turned his back on the Captain without a word. "Is it a crime now to be shot at?" He persisted. Two more officers walked through the checkpoint leading in a tall alien. He had grey mottled skin and was painfully thin by human standards. His eyes were black and darted around the room nervously. His cheeks were huge, bony and pronounced and there was a mound of some kind in the middle of his forehead. "Haldo Compz!" Captain Graves said with relief. "How are they treating you?" "Fine." He grumbled. "I had to go through a detailed scan for security because they needed to classify my genome." "What’s that on your head?" Commander Morrow said, standing up and stepping gingerly towards the buzzing electrical field. "What?" Compz asked, raising his hand to his forehead and wiped off a large lump of mashed potato. "Oh… I was in the galley when the shooting started, things were flying everywhere." One of the officers took him firmly by the upper arm and led him to a vacant cell cube and ushered him unceremoniously inside. He walked in such a way as to always have access to his sidearm. "So I just wait here then, do I?" Compz asked redundantly. "You do indeed." The Starfleet officer told him with a tone that suggested he was doing him a favour by even deeming to speak. "My lunch was somewhat disturbed, I could use a snack." Compz continued. Captain Graves muttered something to himself and turned away from his chief engineer, hiding his expression of amusement. "I will see what I can arrange." The guard told him curtly. "What’s your nutritional requirement?" "Do you have any of your young on board?" Compz asked innocently. "Excuse me?" The Guards eyebrows raised and he took a reflexive step backwards somewhat in surprise. "I prefer fresh but a replicated one will suffice." Compz explained with a shrug. "We don’t replicate our young!" The officer spat the words out in anger as his face glowed an angry red. "Oh you should." Haldo smiled and nodded his head as if enjoying the memory of a delicious meal. "I have some recipe programs on board my ship. I’d be happy to go and get them if you’d like." "We’ll all go." The Captain suggested with a hopeful smile. The officer sneered angrily and turned to leave without another word. "Do you have one of those dogs?" Compz shouted after him as he left through the checkpoint. "Humans!" He shrugged, turning to the Captain through his transparent electrical fence. "What did they do to you?" Graves asked. "They scanned me at a molecular level before they’d even beam me aboard." Haldo explained, leaning back onto his bunk. "They were being very thorough, these are not regular Starfleet." "I tend to agree." Commander Morrow added from his separate cube through the security field. "Do you know what kind of ship this is?" "It’s new." Compz nodded. "Intrepid class I think. I got a partial scan as it drew alongside us. It has several differences though." "The question is who are these people and who was firing at us?" The Captain said thoughtfully, laying back onto his bunk. "The question is, were we safer while we were being shot at?" Captain Joseph Faruqui sat back in his ample ready room at the rear of the bridge complex while he scanned through the files on his desk mounted interface in silence. "This alien…" He began thoughtfully. "Yes sir?" Turaz replied, sitting up suddenly in the seat opposite his commanding officer. "You’ve been my chief medic for three years, have you ever seen anything like him?" He asked without taking his eyes from the monitor. "I have not." The ageing Vulcan assured him. "Not many species get past us, where did he come from?" 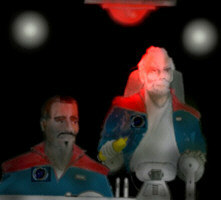 Captain Faruqui turned the monitor off and offered his full attention to his chief medical officer. "He refused to tell us, as is his legal right." Turaz explained, leaning forward onto the desk. "He and the other crewmen from the S.S. Wanderer are clearly friends so we can assume that they have known each other for some time." "I’m confused." Faruqui sat back in his chair, clamping his hands behind his head. "These people are clearly up to no good and yet they were being fired on by an insurgence shuttle of unknown origin which should mean our enemy has shown it’s head." "Perhaps they have fallen out of favour or have outlived their usefulness." Turaz suggested. "It would be logical to destroy their vessel to maintain some level of secrecy." "That’s not their style." He sniffed. "They do things quietly, they haven’t remained hidden this long by drawing attention to themselves." "This smacks of panic." Captain Faruqui smiled, an act his face was unaccustomed to performing. "This could be the mistake we’ve been waiting for them to make." Captain Graves stood to watch as another officer joined the security team. She was around thirty and lean with long red hair tied neatly behind her head. She would have been attractive if she didn’t appear so severe with a pinched up face that looked as though she wanted to bite someone and would happily do so if the situation came close to arising. "I am Commander Sarah Brown." She began as she stepped towards the prisoners while the security team fanned out behind her. "First officer aboard this vessel." "John Graves." He smiled wistfully, stroking his white beard as suggestively as he could manage for a man who had had most of his clothes confiscated. "Captain of the Wanderer." "What ship is this?" Compz asked. "The USS Violator." She replied succinctly without acknowledging the alien. "Violator?" Morrow asked in surprise. "Yes." She agreed impatiently. "I usually get it right." "A little harsh for a Starfleet vessel." Captain Graves smirked with a curiously furrowed brow. "Come with me please." She replied simply. "Where are we going?" Morrow asked, standing up in readiness and eager not to provoke anyone. "I shall say this only once." She began, stepping back and clasping her hands tightly behind her back. "We are going to a secure interview room where there will be two security officers in attendance who will be armed with live phaser pistols on an elevator setting." "She means that the first bolt will be set to high stun and every shot will increase in power after that." Compz explained gravely. "Any attempt to escape will result in severe injury to yourselves." She continued. "When we reach the interview room your responses will be closely monitored by telepaths as well as technology that is highly efficient in detecting mood. If you are honest and frank with me I will return the favour." "Before we go anywhere, I want to know who you are!" Commander Morrow insisted. "You are in no position to be making demands!" The interview room was a spartan box finished in dull grey panels of metallic plastic composites. A table was fixed in the centre with a holographic imager in the middle and three chairs were bolted to the floor on each side. Dim yellow lighting glinted softly off the bare structural support beams that ran through the corners and vanished into the brown carpeted floor. "How long have we been waiting?" Morrow groaned. "Too long." Captain Graves sighed. "This is part of their tactics." Compz said cheerfully as he played aimlessly with the chair controls. "Who do you think it is?" Graves asked conversationally. "I think its Starfleet intelligence." Morrow suggested optimistically. "You hope!" Compz grinned, his thin lips pulled back tightly to show his blunt vegetarian teeth. "I would remind you they’re watching us, probably gaining as much information from leaving us alone as they would from an interrogation." "It can’t be them though, can it?" Morrow said hopefully. "Why would they have fired on us and then saved us?" "We don’t know who fired on us, it could have just been pirates." Captain Graves offered. Suddenly the door hissed open as Commander Brown stepped gracefully through. It slid shut and then locked with a loud thud of metal beams sliding into place. Two guards fanned out from behind her to take position either side of the door, each wearing a black chest plate and a phaser on their belt. "I have some very simple questions for you." She said as she took her seat opposite and casually discarded a note-pad onto the desk. "What a coincidence." Captain Graves smiled. "I would recommend simplicity." Compz agreed. "We tend to drink a lot of our cargo manifest." "Do you, or have you ever worked for Section 31?" She asked, ignoring him. "What’s that?" Compz asked with a shrug. She glanced down at her pad but it relayed no information about his sincerity. A glance at the sweat pouring down the head of the other men told her a great deal more. "So you’re not Section 31?" Graves asked, his false smile vanishing in a rush of relief. "This is a Starfleet Intelligence vessel." She told him. "You do not have dealings with them?" "No." Captain Graves replied firmly. "Fine." She nodded, glancing briefly at her pad. "What were you doing in the trade routs?" "Trading?" Morrow suggested sarcastically. "We were hauling two industrial crates of Tarquarian gin." "I know." She agreed, glaring at him with reserved menace. "But you were doing something else, weren’t you?" "Like what?" Compz asked, deliberately interjecting to take the pressure off his nervous Human comrades. "Why don’t you tell me?" She suggested. "Have we broken any laws?" Graves asked. "I don’t know." She shrugged. "Have you?" "Let’s just tell her." Morrow sighed, slumping back in his chair. "We have little to lose." Compz agreed. "Especially as we have already lost our ship." Captain Graves looked at the faces of his crew and back to the expectant gaze of the Commander and sat back thoughtfully. "This is the part where this stops being an interrogation." He told her. "This is an exchange of information or it’s nothing." "That depends." She cocked her head to one side, clearly intrigued. "No." He shook his head. "We probably have more information than you have and if you want to hear it we want something from you." Captain Joseph Faruqui stepped briskly into the medical bay trailed by an armed security guard who was growing slightly bored with following the Captain around all day and was taking pains not to show it. "Anything new on our guest?" He barked with an authoritative tone drawn from his absolute confidence in his own abilities. "No sir." Turaz reported grimly. "My assistant has run a full tissue scan to the DNA level and has found nothing." "Yes sir." Katherine Rogers agreed, stepping forward with a vial of sickly brown liquid. She wiped a mop of untidy brown hair from her face and continued. "There is no information encoded into him at any level. 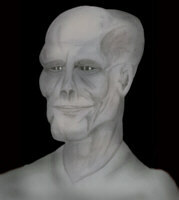 Even though we’re not familiar with his species he is exactly what he appears to be." "And what is that?" Captain Faruqui enquired with a raised eyebrow. "A rather annoying vegetarian species with slightly enlarged cranial capacity, below average physical strength and no heart." Turaz reported, stepping forwards in front of the young medical officer. "No heart?" The Captain sneered in semi-disinterest. "He has a liquid system inside his body but it doesn’t function to oxygenate his blood, he seems to use air only to regulate his temperature." Ensign Rogers called out from a rack of vials where she was fitting in the tissue sample. "He is highly intelligent and well adapted to space travel." Turaz noted. "It’s quite possible that wherever he came from he has brought new technology with him. Perhaps that is what their attackers were after?" "Commander Brown to Captain Faruqui." The voice called out from his comm badge. "Faruqui here." He acknowledged, pressing the badge to open the channel and confirm his identity. "This better be good." Captain Faruqui grumbled as he sat opposite the three crewman from the merchant vessel. "You won’t be disappointed…" Compz grinned. "We’ll save that experience for your wife." "We’ll see." He grumbled, deliberately ignoring his comments as he sat back in his chair. "Impress me." "I am a Moronian." Compz began. "My race is only about 100 years old. We’re well adjusted to space travel because we’re genetically engineered to be." "We have encountered many modified species before." Commander Brown noted with disinterest. "A splinter group from your Federation founded a colony well outside their borders using an experimental transport ship that used a Transwarp catapult." Compz continued. 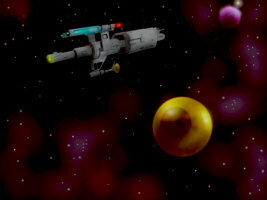 "The supply ship was launched from a machine that created a temporary Transwarp blast. At the other end another catapult was assembled and my race was created." "You have my attention!" The Captain smiled weakly, leaning forward. "15 years ago I stowed away on a returning supply ship knowing that there would be no way for me to return to my home." Compz said sadly. "I was only a child at the time. My parents were the governors of the colony and had found out about the plans that the Federation had for them. I was packaged up with all I would need to survive the journey and at least some of the knowledge my kind had acquired." "What were these plans?" Commander Brown asked, tapping away on her pad. "My colony was destroyed by an anti-matter device that had been brought on the ship I escaped on." Haldo Compz replied, breathing in deeply. Captain Graves reached out and placed his hand supportively on his friends shoulder. "He’s been watching Section 31 ever since." Morrow said softly. "We’ve all been trying to expose them." "I see." Captain Faruqui sat back in his chair thoughtfully. "Your turn." Captain Graves said, nodding towards the intelligence officers. "Who was firing on us?" "That was what we call an insurgence shuttle." The Captain explained, deciding to extend them some of the answers they were looking for. "It’s basically an upgraded Runabout. The central mission pod is loaded with twin retractable full size photon torpedo launchers and the side phasers have been fitted with pulse phaser cannons." "We were nearly destroyed by a Runabout?" Morrow sighed. "Perhaps when the mouse goes after the cat it should be better prepared…" Commander Brown suggested smugly. 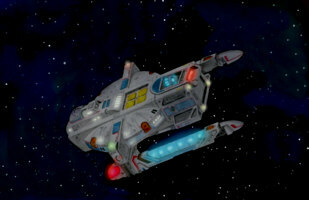 "Insurgence shuttles are the most commonly used vessel that Section 31 employs." The Captain continued. "They’re small, difficult to lock onto with weapons and highly manoeuvrable." "We spotted that." Compz replied grimly. "Your turn again." Commander Brown interjected. "How were you watching Section 31 without them knowing?" "First a question…" Captain Graves grinned knowingly, toying with his wispy white facial hair. "If we have located a base of operations for them what will you do?" "We will find out what they’re up to and stop them getting up to any more mischief." Captain Faruqui snorted. "That’s why we’re out here." "This technology is incredible…" Ensign Katherine Rogers enthused, handing the tricorder back to the gangly alien, Haldo Compz. "Yeah." He nodded. "This is about right." The young medical officer looked into the large orange sphere on the cargo bay floor and almost laughed at its ingenious simplicity. The Captain and his entourage stood staring at the translucent lump of inert bio-matter that had a darker blob in the centre. "This is it?" He asked in surprise, turning his attention to his senior medical officer. "Apparently so." Turaz agreed with Vulcan disparity. "It was relatively straight forward to synthesise and is relatively unsophisticated." "It’s one of those brilliant ideas that simply never occurs to you." Ensign Rogers added. "We’ve been dropping these probes out in the trade lanes for years." Commander Morrow smiled. "And they’re totally undetectable?" Commander Brown asked, scratching her head curiously. "It’s just a lump of inert bio-matter." Compz explained proudly. "It won’t show up on sensors because the beam just goes straight through it, a navigational deflector will instantly vaporise it so you can’t collide with them and nobody is looking for them anyway!" "And they’re solar powered." Captain Graves added to make himself appear useful. "We position them in line of sight with a sun and the photon energy provides the fuel it needs." "Every vessel that passes leaves an energy imprint on them." Compz continued. "The nucleus is damaged by energy signatures, we just analyse them with normal sensors and they tell us how close, what kind of ship and what it was doing when it went past them." "A totally passive sensor grid?" Captain Faruqui nodded, growing impressed with the abilities of the seemingly inept Wanderer crew. "Section 31 has no idea it’s out here." Captain Graves added. "And we know where their ships have been going because all other traffic is declared, it’s just a case of eliminating everything that should have been there." "And you’re going to share that information with us?" Faruqui asked leaving little room for a negative answer. "We’re coming with you." Captain Graves smiled. "So we can show you." "We’ve worked too hard and for too long not to see this through." Compz pleaded. "You will each have a guard assigned to you and your movements will be severely restricted." Commander Brown acceeded grudgingly. "That is if we do decide to permit this." "We’ll tow your ship to the nearest moon and leave it in captured orbit." The Captain nodded. "We’ll leave it cloaked so it won’t draw any attention. "It needs extensive repairs but you can sort it out later." "Cloaked?" Morrow exclaimed in surprise. "You’re on a Starfleet Intelligence vessel now." Captain Faruqui told him. "The rules no longer apply."